Yes, ALMOST. This week, the EXAIR Blog has featured some excellent explanations of the science behind the operation of compressed air products. On Tuesday, John Ball posted the best explanation of SCFM vs ACFM that I’ve come across, and I’ve been explaining this to callers for almost four years now. I’m using his blog to perfect my “elevator pitch” on this topic. It will still likely require a building with more than ten floors, but I think that’s OK.
Also on “Two Blog Tuesday,” (this week only; I’m not trying to start anything) Dave Woerner’s gem of a blog detailed the terminology associated with pressure measurement, and why we use “psig” (g = gauged) – in a nutshell, the compressed air inside the pipe doesn’t care what the pressure outside the pipe is. And, since he mentioned it, I might add that most of agree that we care even less about how a certain NFL team’s footballs were (or were not) properly inflated. I mention these earlier blogs to get to the point of MY blog today…a bit of theory-to-practice, if you will. Once you’ve gotten a decent understanding of these principles (or have the above links bookmarked for quick reference,) we can apply it to what’s needed for the proper operation of a compressed air product itself. This table comes directly from the Installation & Operation Instructions for the Super Air Knife. The reasons for this are two-fold: First, the pipe…longer runs of pipe will experience more line loss (a continuous reduction in pressure, due to friction with the pipe wall…and itself) – so, larger diameter pipe is needed for longer lengths. For another practical demonstration, consider how much faster you can drink a beverage through a normal drinking straw than you can through a coffee stirrer. Not as dramatic as the leaf blower & volleyball (you really want to try it now, don’t you?) but you get my point. Second, the Air Knife…the longer the Air Knife, the more air it’s going to use. And, if it’s longer than 18”, you’ll want to feed it with air at both ends…line loss will occur in the plenum as well. In closing, I want to leave with another video, shot right here at EXAIR, showing the actual reductions in pressure due to line loss through different lengths, and diameters, of compressed air supply line to a Super Air Knife. If you ever have any questions about compressed air use, or how EXAIR products can help you use your compressed air more efficiently, safely, and quietly, please give us a call. Generic Layout drawing of compressed air piping system. In order to fully understand how efficient your compressed air system may be, you will need to generate a system pressure profile at some point. This is a list or diagram of what pressures you have in your compressed air system at specific locations, as well as the pressure required by all the demand devices on your compressed air system. One of the reasons for the pressure profile is that you may have an application that is far away from the compressor but also highly dependent on a specific operating pressure. You may also find an application that, due to pressure losses within the system, causes an artificially high pressure demand. The list below gives the critical points for measuring your compressed air system profile. 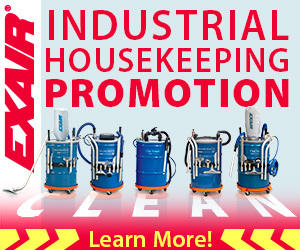 If dryers of any type are being used after the compressor measure downstream from the dryer. After each intermediate storage device, such as receiver tanks. At the point just before the main line from your compressor room branches off to distribution. The furthest point of each header line you have installed. On both sides of every filter/regulator units that are at high pressure point of use applications. To give you an idea of why it is so important to measure these locations, take a look at the blogs we have posted on pressure drop. (Link Here) As you can tell by the list of blogs that comes up, pressure drop through piping can really cause a lot of wasted energy in your compressed air system. If you can get a good base line measurement by utilizing a pressure profile then you can start the process to optimizing your compressed air system. 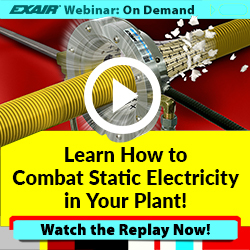 The EXAIR Six Steps To Optimizing Your Compressed Air System. 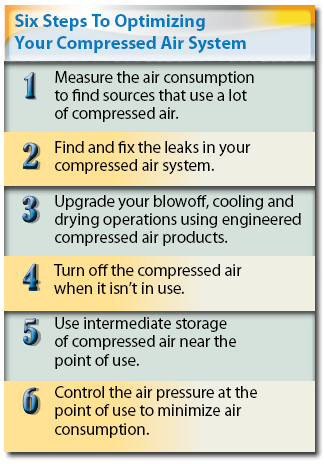 If you would like to discuss this or any of the other 6 steps to compressed air optimization, feel free to contact us.